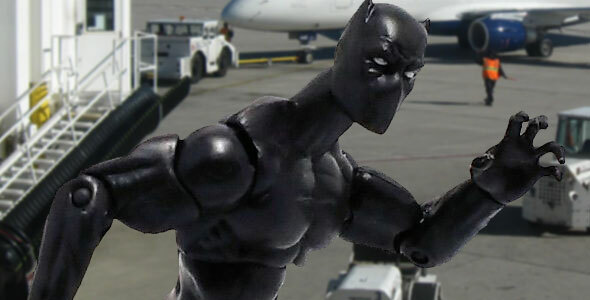 With the third installment of the Captain America movies looming in the horizon, Hasbro has been rather sneaky and instead of revealing early too much about the movie designs, they opted to go for a more comic-inspired look for this Black Panther action figure. I remember that when I saw the first wave of figures in the Marvel Legends Infinite Series for the Captain America: The Winter Soldier movie, I thought that Hasbro had made a mistake including the version of Captain America in his WWII uniform. The figure is a completely new sculpture, and even though this uniform does not appear in the actual movie, the sculptor at Hasbro still wanted to go for a more plausible look by incorporating a lot of details and textures into the mix. One character I remember rather fondly from my Mego days is Captain America. When the Captain America: The First Avenger movie came out, I was rather excited for the opportunity to get an updated version of his costume, but for whatever reason I was unable to really sink my teeth into that line. Hasbro has had quite a large number of Captain America action figures made in recent years and even though I did pick up a fair share of them, my collection still lacked a classic version of him until the release of Marvel Universe Series 5. Also known as the Deluxe Set Hydra Soldier, this figure was part of the toy line made by Hasbro for the movie Captain America: The First Avenger. Well, today I’ll be talking about something a little different, a 1:18 vehicle I found at a local store. The vehicle is a WLA 1942 Flathead Harley Davidson motorcycle, and was produced by Maisto. Super Shield Captain America is intended to be from the Ultimates continuity, as attested by the slightly more down-to earth attire. The overall level of detail is excellent, with good body proportions and the upper torso scale texture, along with the seams and straps added to the rest of the costume. After the “death” of the original Captain America in the comics, there were more than a few candidates to occupy his place, but ultimately the mask and shield ended up in the care of another comic book character that has had some experience returning from death, James Buchanan Barnes, a.k.a. Bucky, a.k.a. Winter Soldier. One of the figures I was most excited about, from the Captain America toy line by Hasbro, was this version of Captain Britain (06). Unfortunately, once the figure started showing at stores, I was less than thrilled by the paintjob it got. Crossbones is possibly the most striking figure released in the second wave of figures for the Captain America: the First Avenger movie line.